Todd Valdez, owner of Sunkey Energy, on one of the solar panel roofs his team installed in Colorado. "The companies we're working with are begging to fill the [job] slots they have because they're growing so much," says Chris Gorrie, campus president of the Ecotech Institute, a for-profit job training center for solar and renewable energy in Aurora, Co. In December, wages in the United States rose 2.5% compared to a year prior. Solar installers are making $21 an hour on average, up 5% from a year ago -- or double the national average, according to the Solar Foundation. "Our workload has definitely been rising tremendously," Valdez told CNNMoney by phone while on one of his work sites in Broomfield, Co. 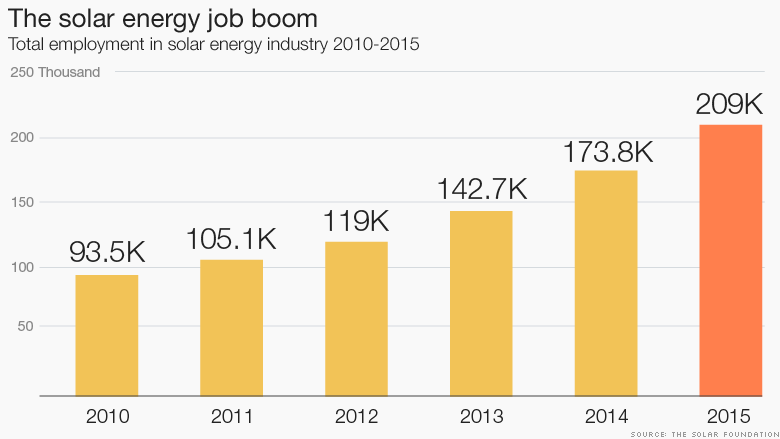 The solar industry is "a good place to go now if you're looking for a career change." 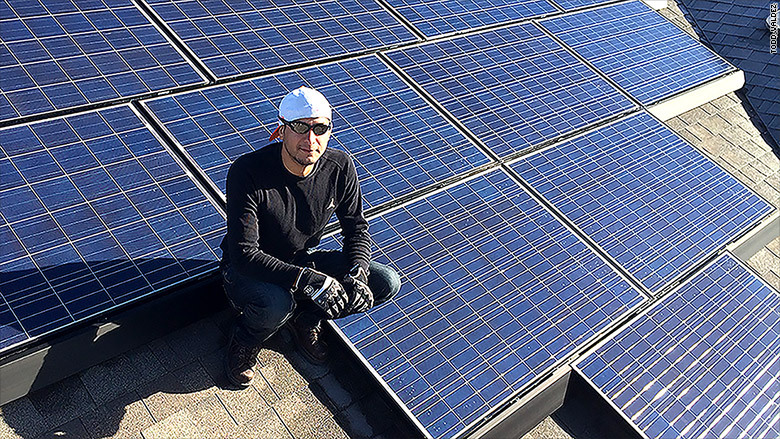 Solar jobs -- particularly installers who work on roofs -- are not for everyone, Valdez cautions. It's lots of outdoor work, with heavy equipment. He's seen people quit "in hour one." But it's not all sun drenched states either: No. 2 for solar jobs is Massachusetts, thanks to policies that have made it attractive for residents to install solar panels. Experts say solar technology is good enough now that panels don't require direct exposure to the sun to generate electricity. New York and Arizona are also top states for solar job seekers, according to the Solar Foundation. Businesses and homeowners are eligible for a 30% tax credit if they install solar panels on their property. That's been in place since 2006 but in December Congress renewed the tax credit for another six years. That lowers installation costs considerably. Cheap oil and gas prices are creating a short-term headwind for solar, Luecke admits. A few years ago, solar was seen as a cheaper alternative to oil and gas. Now with oil and gas prices so low, it's hard to convince some consumers to switch to solar. "Natural gas is very, very inexpensive in many markets so it's hard to disagree with it," says Luecke. But she counters: "solar and clean energy are here to stay."